As the Mac 911 columnist at Macworld, I’ve received hundreds of emails from people who have had Wi-Fi fail on their computers. In August 2016, I wrote a column that provided all the advice we had to troubleshoot the problem, which is sometimes caused by system software, sometimes by failed hardware, and sometimes by a bad connection. 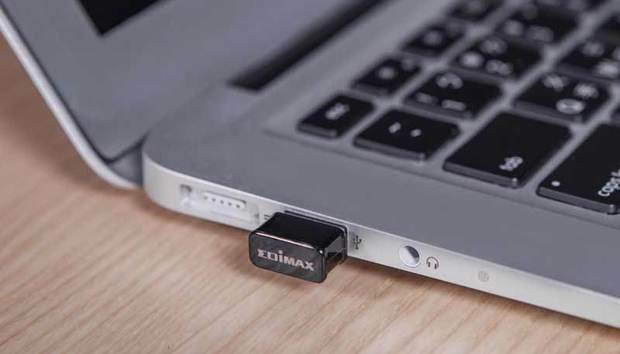 If you’ve gone through all those stages or you want a second Wi-Fi connection on your Mac—useful for firewalls, relaying a Wi-Fi network, and other purposes—the Edimax AC1200 Dual Band Wi-Fi USB Adapter (model EW-7822ULC; $24.99 MSRP; available on Amazon) seems to be not only a good solution, but the only solution. Once, a variety of alternatives existed for the Mac, but there’s no simply not enough of a market for them, and Edimax continues to update driver and utility software, keeping it viable. The drivers for macOS 10.12 Sierra only appeared in January, if you had previously discounted this as an option. The same driver also support OS X 10.7 to 10.11, making it a great solution for owners of Macs that can’t be updated or they prefer to keep on an older release, and have had a Wi-Fi failure. However, 802.11ac has appeared in waves. Wave 2 adds new features that can increase throughput and help with network capacity, but not all routers (and none of Apple’s) support it. MU-MIMO allows a Wave 2 router to divvy up the simultaneous conversations it can have among multiple devices if those devices can’t occupy all the slots. A computer might fill the typical four slots available, while the Edimax AC1200 fills two and some mobile devices only use one. Edimax also includes beamforming, which lets an adapter and router focus more of their transmitting signal energy at each, producing a stronger (and thus often faster) connection. Edimax says the AC1200 adapter maxes out at 300Mbps in 2.4GHz (with 802.11n) and 867Mbps in 5GHz (with 802.11ac). On busy networks that have Wave 2 routers, your adapter will take up only half the simultaneous capacity while it’s communicating. If you don’t have 802.11ac or don’t have the newest wave, the Edimax future proofs your update. The wireless utility mimics Apple’s Wi-Fi menu to manage network connections. Behind the scenes, the driver updates network settings, so you can modify details (like DNS or other elements) via the Network system preference pane. You use the utility menu to change the network to which you want to connect, however. Unlike Apple’s hidden Option-click for its Wi-Fi menu to reveal more details about the currently connected and available Wi-Fi networks, Edimax’s just shows the names and fills in the wireless wave form to approximate signal strength. While connected, a tiny blue LED is lit on the adapter. If your router supports WPS for easy connections, you can select that from the menu, and the utility generates a connection PIN. The Edimax utility includes its own profile manager to store Wi-Fi network information. I tested the adapter via both a Mac mini with USB 3.0 Type-A connections and a 12-inch MacBook with USB-C using a dock. The adapter worked fine even when plugged in through an intervening device, such as a USB keyboard on the Mac mini and the USB-C dock. With a nearby 802.11ac Wave 1 router, I routinely achieved speeds from 100-120Mbps from an Edimax-equipped Mac to another Mac that was connected to the same router via ethernet measured via the iperf utility. I expected faster performance, but testing with the same setup and using the MacBook’s built-in 802.11ac adapter, speeds bumped only to 150Mbps. Your wireless network environment and resulting performance will vary from mine—and minute to minute, too. Edimax earns big points by including an uninstaller along with its installer. This lets you remove the driver without having to use Terminal if you’re no longer using the adapter and don’t want the cruft of unneeded network software running. A big warning on size: the adapter is really tiny. I almost lost it in testing when it slipped out of my grasp. This is to keep it low profile, and the assumption is that most users will likely leave it in all the time. However, the small format means a tiny antenna, too, so you might find throughput is inconsistent depending on objects around the side of your Mac and its orientation to a base station. Wi-Fi signals penetrate objects, but the denser and object and the more of them between an adapter and a base station, the less power that gets through or can be received. If your Mac’s Wi-Fi has failed and you’ve tried everything free, and it’s running OS X 10.7 to 10.11 or macOS Sierra, drop $20 and put yourself back in wireless business.